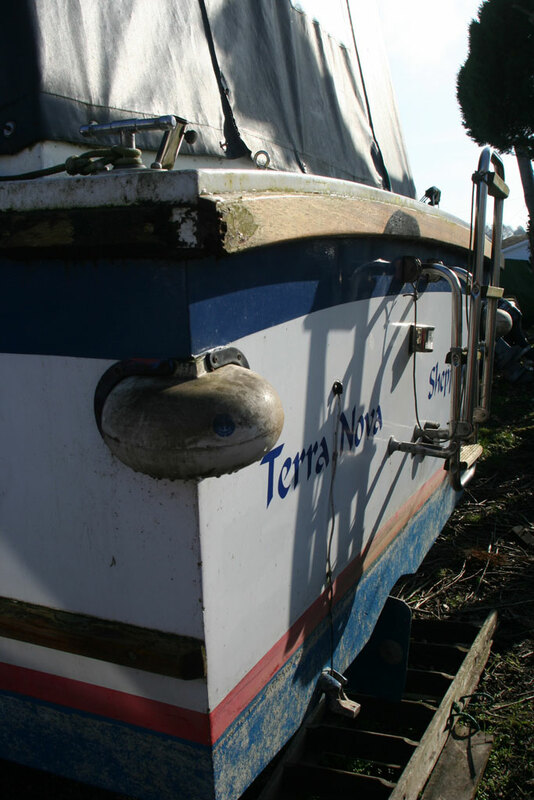 I took a wander down to the Bridge Marine boatyard on Sunday – just to check that Terra Nova, the old Seamaster Admiral cabin cruiser that Julie and I own along with my brother, was still where I left her when she came out of the water back in October. Gratifyingly, she hadn’t moved but, as with most boats left over a long hard winter, she’s looking a little the worse for wear. Black stripes around the topsides where the rainwater had run off the deck and cabin top carrying with it all kinds of muck, green algae stains, peeling varnish from some of the brightwork – she could definitely do with a substantial chunk of ‘tlc’ but I didn’t really expect anything else. I swear she looked accusingly at me as if to say: “Where the hell have you been and how could you let me get into a state like this?” But that’s probably just my guilty conscience poking me. The truth is that in this age of increasing pressure on time there always seem to be so many things to do – work around the house, things to do with my job as a Community Editor, family matters (my daughter is going to make me a grandfather for the first time early in March) – I’m sure you know what I mean. And poor old Terra Nova just keeps being pushed down the stack. But last weekend saw the sun breaking through for the first time in Heaven knows how long. The temperature soared into double figures and the snowdrops are blooming everywhere – spring is definitely just around the corner and my brother and I have started talking about all the things we need to do before Terra Nova can go back into the water, which I always find an exciting time. Mind you, as I stood looking at the somewhat forlorn old boat, one of my wife’s favourite cartoons came back to mind. Anyway, I’ll have to get on with the list of things that need doing. ONE of my favourite charities – the River Thames Boat Project – is celebrating the 25th anniversary this year and to mark the occasion, it is renaming its community barge. Kingston major Councillor Mary Heathcote OBE, attended the renaming ceremony of the barge, berthed in Kingston and a Kingston Young Carer performed the ceremony officially renaming the barge ‘Thames Venturer,’ from its original name of ‘Richmond Venturer.’ It was performed in the best traditions of boat christening, with a bottle of fizz broken over the bows. Other Kingston Young Carers, the boat crew and charity trustees were present for the ceremony, which took place at the beginning of the barge’s first cruise of this year. The Thames Venturer takes parties of children, the disabled and the elderly on river trips to introduce them to the ecology and wildlife of the river. For further Information contact The River Thames Boat Project – 020 8940 3509 or vist their website.